We're starting a new meeting for the Relief Society (the women's organization in our church) this month. It's called the Cooking Club. 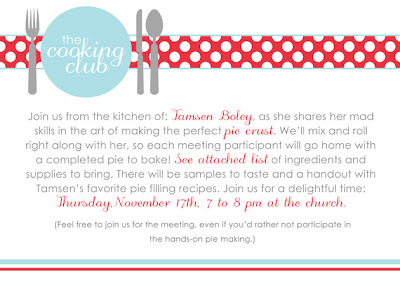 We're inviting sisters (or they can volunteer) to hold a meeting in their home to demonstrate and share a taste of one dish from their family favorites recipe file. The focus will be on simple and healthy dishes their family loves and that they enjoy making. They can share additional recipes on a handout if they'd like, and I'll help them with the entire process. I'd much rather prepare a "tried and true" recipe I've actually tasted. I've been making a point of trying new recipes lately and have had a lot of misses--and some successes too. More misses though. We have some women in the ward who love to cook and are good at it. I love your idea of the cooking club, and I wouldn't be too sad if you wanted to share any of your favorite recipes (or the ones you learn in the process). I love to try new recipes too, and I much prefer trying ones from trusted sources. Yesterday, I made the squash carrot soup you posted last year, and I still love it. So healthy and tasty too. I still love that soup too! Been craving it lately. I'll definitely share the Cooking Club recipes with everyone.